If we are successful, this approach can be applied to other public lands in Maine where management actions might be controversial, as well as serve as a model of how research on social values can be integrated with ecological data to inform stewardship of public lands. Acadia’s lakes and streams support many human uses, including drinking water supply, fishing, boating, and scenic viewing. Freshwater also provides habitat for wildlife like insects, loons, and turtles, and streams influence the quality of coastal waters. Managing the different uses of water is a challenge for the National Park Service, especially when activities come into conflict. Fishermen introduce non-native bait fish. Scientific equipment clashes with visitor expectations of natural scenery. Boat engines disrupt moments of quiet contemplation. Lakes that provide drinking water must be strictly protected. Meanwhile, lakes and streams are changing. Increased precipitation has flushed more organic matter into lakes, making them less clear. Winter ice and snow dynamics are more variable, and temperatures are warming. Acadia’s scientific staff have a good set of long-term data on the physical and ecological characteristics of lakes and streams, but social characteristics are not well known. 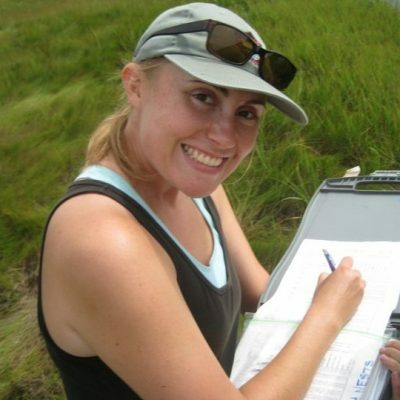 Kate Ruskin, a lecturer and undergraduate coordinator for the Ecology and Environmental Sciences program at the University of Maine, combines ecological and social science methods to address conservation issues. In this project, conducted with undergraduate students in an environmental science field course at UMaine, Ruskin will survey park visitors, local residents, managers, and others (using anonymous questionnaires) to identify what they think about Acadia’s water resources, what they value, and whether people’s actions agree with their own values or those held by others. Survey answers will be quantified using the “Potential for Conflict Index” to illustrate the consensus among stakeholder groups, and then Ruskin will map the perceived social values and ecosystem services, providing a picture of human values and potential areas of conflict across the park to inform decisions and actions related to managing lakes, streams, and wetlands in Acadia. Ruskin applied some of these methods, including working with students, in a previous study of the Schoodic Woods Campground. After background research and planning in 2019, Ruskin will conduct the survey in 2020.